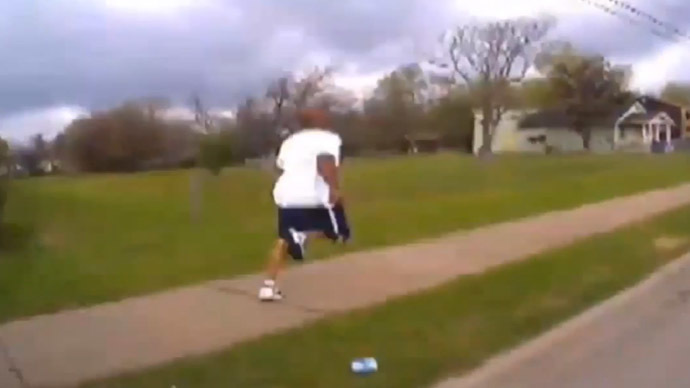 The footage was posted by police, and shows 44-year-old suspect Eric Courtney Harris running down a street away a pursuing police car. The officer runs up to him, puts Harris on the ground, and then a shot is heard – and the suspect starts moaning in pain. “I shot him. I’m sorry,” Bates’ voice appears to say. Despite medical aid, Harris later died in the hospital. Reserve officer Bates has so far refused to comment on the situation. “It was me. My attorney has advised me not to comment. As much as I would like to, I can’t,” he told the local media outlet Tulsa World. Eric Courtney Harris was a convicted felon, and according to a police report on the incident, he was being detained after being caught selling a weapon to an undercover officer. Over the last 10 years, Harris had six criminal felony cases and a Misdemeanor-1 case filed against him: he made threatening phone calls, escaped a penal institution in 1990, and carried out an armed robbery. Most recently, Harris had come to the attention of police for suspected crystal meth distribution. Tulsa Police Department homicide Sergeant Dave Walker said Friday that although the killing happened within the city limits, the department wouldn’t look into the shooting if the Sheriff’s Office didn’t ask them to. “And they have not asked us to,” Walker said, Tulsa World reported. Bates was named the town’s Reserve Deputy of the Year in 2011, according to the Sheriff’s Office website. Harris’s death comes only a couple of days after shocking dashcam footage captured the deadly shooting of a mentally ill man in Florida. And a week ago, an officer in South Carolina shot and killed 50-year-old Walter Scott, who tried to escape a traffic stop. In that case, the violence was captured by a bystander using an iPhone, and the cop was fired from the force and charged with the killing. Last year, massive public protests began after the officers who shot dead unarmed 18-year-old Michael Brown in Ferguson, Missouri, and 43-year-old Eric Garner in NYC, escaped indictment. Thousands marched in the streets across the US outraged by what they called the racist and discriminatory attitude of the police toward black suspects. In March, the Department of Justice issued a report on the police violence in Ferguson, revealing what it said was an unlawful bias against African Americans.